This new suite of knotted, crocheted, and beaded work, some with flood wood from my property in the Mississippi River floodplain in Elsah Village, Illinois, was sourced this winter by an invitation to participate in an outdoor installation at the Audubon Center at Riverlands, a 3,700-acre wetland and migratory bird sanctuary co-developed by the National Audubon Society and the U.S. Army Corps of Engineers. The curator knew I was working with flood wood and knew my 2D work from a 2016 interior installation at the Audubon Center, titled “Seeing Water.” The eco focus continues after a three-year project (now complete) of 300+ feet of pieced, painted and sewn textiles, titled "Riverwork Project.” Sections of the project will be installed at the St. Louis Lambert International Airport gallery from November 2018 to May 2019. While my formal training is in 2D design, printmaking, and painting, this work is from self-taught traditional textile techniques begun in childhood and pursued throughout my domestic life. Knotting is a recent acquisition in my skill set and came from direct observation of the work of Jane Sauer, a former studio mate and decades-long friend and colleague. I have studied non-Western art forms, especially Survival Arts of the Pyramid Lake Paiutes by Margaret M. Wheat, and basketry of American and Canadian native tribes, global contemporary basketry, and the earth-focused spiritual aesthetic of Australian aboriginal artists. Vernacular African architecture also informs the work, as do repetitive rhythmic drumming and dance. Titles for each piece, new in my oeuvre, come from collaboration with my husband, Dr. Colin Campbell, Emeritus Professor of Humanities, Principia College, Elsah, Illinois. 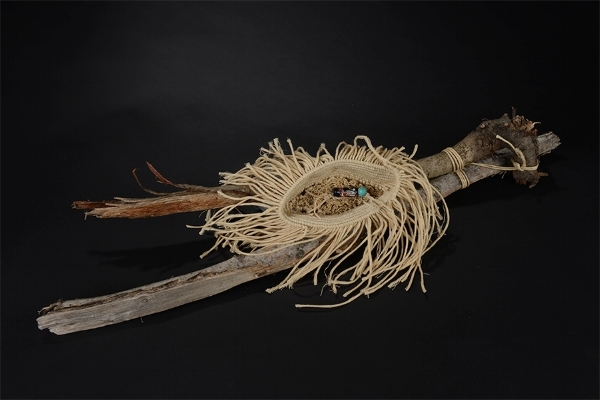 The scale is small, and materials are limited, as I am thinking birds and nests in the floodplain and ritual objects of spiritual significance for personal domestic space. The work should be considered as trans-tribal, amuletic sculpture.